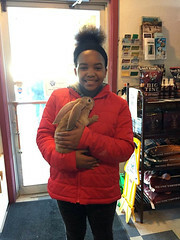 Our kids were able to reap benefits of a fantastic day interacting with the animals at a local pet store because of the field trip their teachers, Taylor Mathias and Bethani Sando, planned. 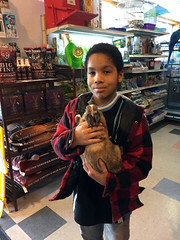 They spent time in the community with positive adults, while having fun interacting with the critters at The Pet Store in Siren, WI. They had the opportunity to interact with a cat, ferrets, rabbits, a cranky parrot named Morgan and a host of scaly reptiles. They absolutely LOVED their time there, especially the soft and fuzzy feeling of the rabbits. One of the rabbits even nibbled on a young lady’s cheek. Going to a pet store is way funner than swinging on a swing or playing a game. For years, the effects of animals on their human companions have been studied. Numerous physical and mental health benefits have been shown in humans who share their lives with animals. 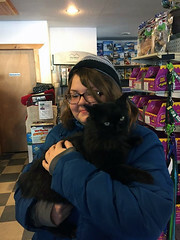 Beyond that, research has shown physiological effects on people who merely have contact with animals, such as the lowering of blood pressure in nursing home residents petting a cat. Specifically, in the arena of mental health treatment, the use of animals to help facilitate mental health interventions has been in existence for hundreds of years in some form or another. More recently, evidenced based animal-facilitated interventions have been increasing in the world of mental health. Organizations including PATH International http://www.pathintl.org/ EAGALA http://www.eagala.org/ and AAI http://www.aai-int.org/ help to provide professional standards and education to the varied field of animal assisted therapy. 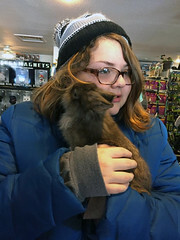 Visiting The Pet Store and spending time with animals, of course, fits into the Northwest Passage philosophy of living an everyday therapeutic lifestyle. Read more about the eight elements at http://nwpltd.org/passageway/.